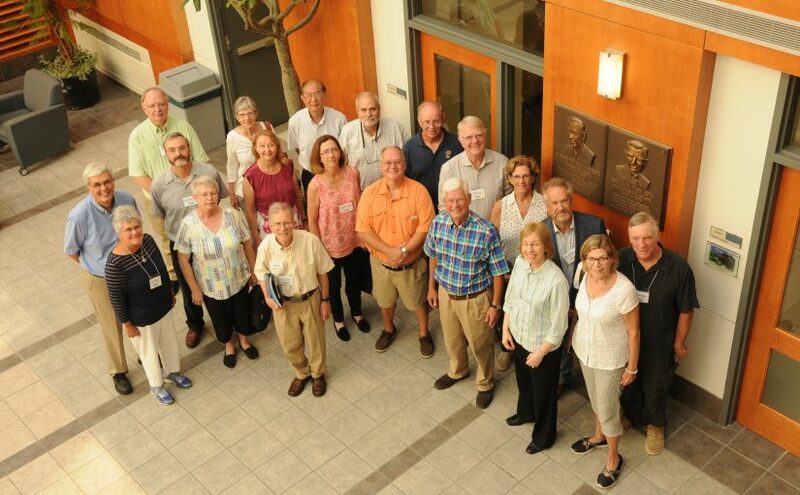 A unique reunion on Hope’s campus highlighted faculty-student rapport that time and distance could not shake or undo. 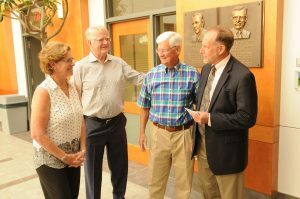 On the 50th anniversary of his arrival at Hope College, Dr. Sheldon Wettack, a member of the Hope chemistry faculty from 1967 to 1982 who served as dean of the natural sciences for the last eight of those years, was celebrated by his former Hope research students in July. During his 15 years at Hope, Wettack mentored 21 Hope students — self-named the Wettack Research Warriors — in his physical chemistry laboratory in both Lubbers Hall and the Peale Science Center. Upon invitation from organizers Dr. Ken Janda ’73 and Dr. Charlie Bibart ’69, thirteen of those former students returned for the reunion on campus, a few for the first time in decades. What they found is a college that has grown in size and stature yet with a still-strong reputation in and mission for the natural sciences. Not coincidentally, the Wettack reunion coincided with the first annual Schaap Chemistry Symposium, with Dr. Sylvia Ceyer ’74 as the keynote speaker. Ceyer is the John C. Sheehan Professor of Chemistry at the Massachusetts Institute of Technology and an elected member to the renowned American Academy of the Arts and Sciences. And she was a research student in Wettack’s p-chem lab. 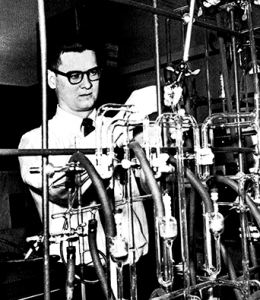 “There is no doubt in my mind that the encouragement and guidance of Sheldon, along with the warmth of his wife Marilyn throughout my student years, were crucial ingredients to my scientific future,” praises Ceyer. 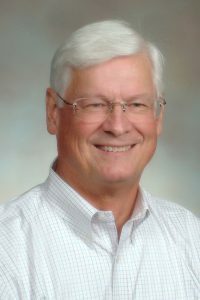 Though Wettack left Hope in 1982 to become art and sciences dean at the University of Richmond, then president of Wabash College, and finally vice president/dean of the faculty at Harvey Mudd College in California, he returned to the college in 2004 to teach part-time. He was invited back to “help out around the chemistry department, and I thought it was be a good way to go into retirement.” Then he laughs, fully aware that he has never abided by the full definition of that r-word. He even became the announcer for Hope’s swim meets. For Bibart, who spent his career in the pharmaceutical industry and is now retired, the reunion was a terrific way to reconnect with his former mentor and other Hope alums, some of whom he hadn’t seen in over four decades or had never met since the returnees spanned a decade of Hope years. 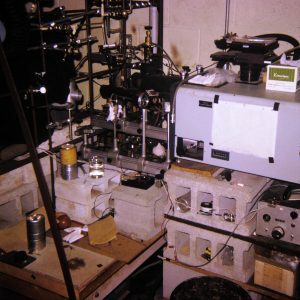 With great affinity and technical jargon, they reminisced about all manner of memories and methodology, including the acquisition of a gas phase photon-counting fluorescence spectrometer that needed construction in Lubbers Hall. Though Wettack was its chief constructor, he allowed his research students to work right alongside him and learn the nuances of laboratory assembly. The gas phase photon counting fluorescence spectrometer constructed by Wettack Research Warriors in Lubbers Hall. Janda, who has remained in contact with Wettack throughout their careers, concurs. Wettack opened doors for him and others, providing opportunities that steered him, and them, toward meaningful, reputable science career experiences whether in higher education or industry or public service. Working with those who have youthful exuberance and enthusiasm for chemistry seems to be a Wettack forte. Before finishing his doctorate at the University of Texas-Austin in the mid-70s, he taught high school science. After completing his degree there, he came right to Hope to instill in those slightly older the hard work and love of chemistry. 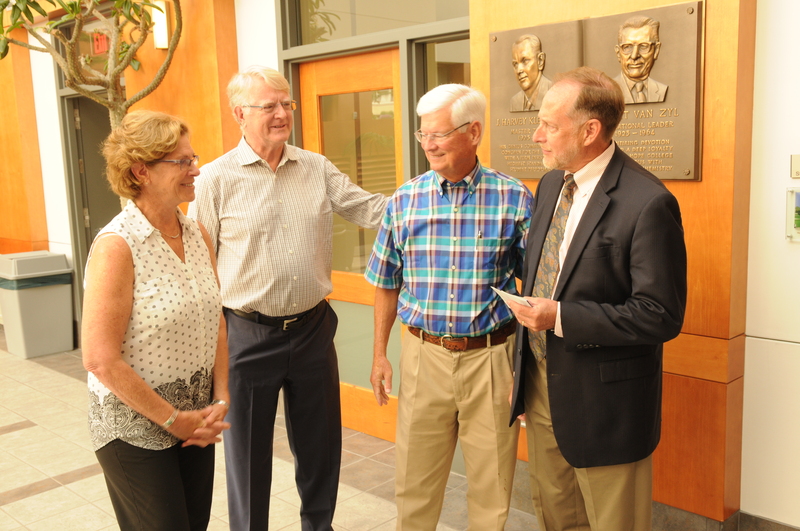 Patsy Meliere ’72 Janda and Ken Janda ’73 (far left) present a check to former President John Knapp (far right) to honor Sheldon Wettack (center) and benefit the Wettack Research Fellowship. Janda, along with his wife, Patsy Meliere ’72, also paid homage in one more way to their former mentor. They contributed a significant gift to the Wettack Research Fellowship, a fund that supports Hope students in summer research experiences. “The strength of the sciences at Hope is what drew us here in the first place, and we want to see that continue,” says Patsy of their rationale for giving the gift to the fund’s endowment. As their time together wound down, the Wettack reunion attendees presented Sheldon and Marilyn with a commemorative book filled with pictures and epistles detailing his former students’ life trajectories and Wettack’s effects on them. Each story — 17 in all — told a tale of determination, scientific passion, and a Hope education used well. Make a gift to support the Wettack Research Fellowship. I hope everyone who participated enjoyed the reunion as much as I did. It was a GREAT chance to reflect on life and what is important to us. Thanks to Charlie Bibart for co-organizing and, especially, putting together the memory book. I hope those who were not able to travel to Holland for this occasion enjoy the blog, and learning about their classmates from the memory book.